Based on the hit game released for Nintendo DS, this enhanced version contains 34 unique versions of Solitaire from your favorite families including Klondike, FreeCell, Spider, Canfield, and many others. Professionally developed and loaded with features, this product is a “must” purchase for your iPad library. 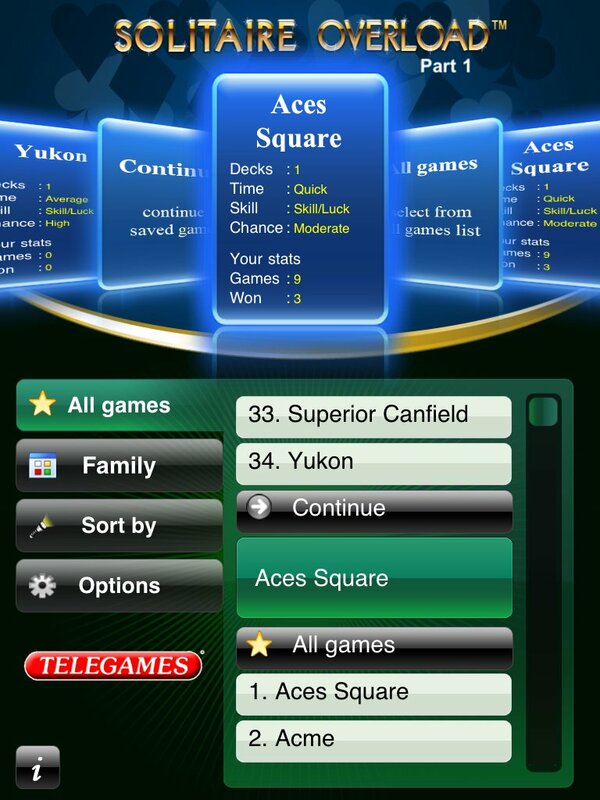 In a single product, you get Aces Square, Acme, American Toad, Baker’s Dozen, Baker’s Game, Beetle, Big Forty, Blind Alleys, Blockade, Bristol, Busy Aces, Canister, Congress, Corners, Deuces, Double Easthaven, Double FreeCell, Eight Off, FreeCell, Giant, Golf, Good Measure, Josephine, Lady Palk, Little Napoleon, Number Ten, Quadrangle, Raglan, Royal Parade, Scorpion, Shamrocks, Spiderette, Superior Canfield, and Yukon. Replay value is huge since all games have been designed with VUE™ TECHNOLOGY providing Virtually Unlimited Entertainment.